Ray and Susan Martin of East Zorra Mennonite Church, Tavistock, Ont., visit with Fauzia Mazhar and her daughter Mehar Nayyar at the Floradale potluck. Burton Buller came to Ontario’s Waterloo Region this spring to explore the many Mennonite-Muslim activities taking place in the community for a new documentary exploring peace traditions in both the Christian and Muslim faiths. His hour-long piece is to air on the ABC network sometime in 2011. What he found in Waterloo Region were Scriptural Reasoning, Muslim students at Rockway Mennonite Collegiate, a bridgebuilding breakfast sponsored by Mennonite Central Committee (MCC) Ontario, and multiple refugee sponsorships by both Mennonite congregations and Muslim organizations. Scriptural Reasoning was begun in 1994 by Peter Ochs, a Jewish rabbi and currently a professor at the University of Virginia, to bring different faith groups together for the purpose of understanding each other, both their similarities and differences. Yousef Daneshvar Nilu, a Shi’a Muslim student sponsored by MCC to study at the Toronto School of Theology in the late 1990s, proposed that Scriptural Reasoning could take place between Mennonites and Muslims in Kitchener-Waterloo. Daneshvar Nilu and I (as pastor of Wilmot Mennonite Church, Ont. ), each prepare a topic—such as God, or the nature of human beings—and make presentations from the Qur’an and the Bible. Discussion then follows with a number of pastors in attendance. An intense focus on the differences between Muslim and Christian views on revelation has been particularly invigorating for participants. Muslims believe the Qur’an was recited to Muhammad by the Angel Gabriel over a period of 22 years, and was written down when Muhammad recited it to his followers. 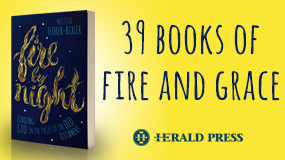 The books of the Christian Bible have 1,600-plus years of history of creation and editing by many different authors in different cultures and times. Daneshvar Nilu noted at one exchange that he finds that “Christians have too much human in their Scriptures.” This led to a discussion of “literal interpretation” in Islam and Christianity. 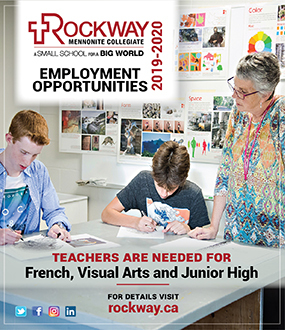 Betsy Petker, principal of Rockway Mennonite Collegiate since January, believes that there are currently six or seven Muslim students studying there; since students don’t have to indicate a religious background in applying, the number is inexact. 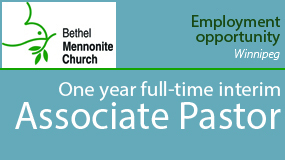 This has been an ongoing trend, although Muslim parents are clearly told that the school is Mennonite Christian, that regular chapels and religious studies courses taught from a Christian perspective are mandatory for all students, and that Mennonite Christian faith pervades the teaching of all topics. 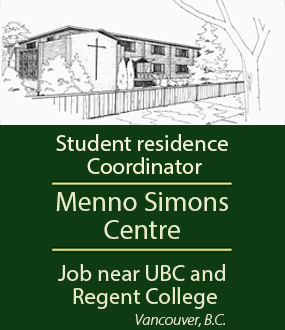 Petker feels that the Mennonite focus on peace and understanding, as well as high academic standards, have attracted these families to Rockway, where students have been impressed by the non-judgmental questioning and acceptance of people from other faiths. The Interfaith Bridgebuilding Breakfast was begun about three years ago by MCC Ontario at the encouragement of local constituents. The group has roots in Mennonite pastor, writer and educator Brice Balmer’s work as chaplain at Kitchener’s House of Friendship, where halal foods—prepared according to Islamic rules—were needed for new immigrants. Balmer noted that “Shafiq Hudda [an imam at the Islamic Humanitarian Service] and I met with Arli Klassen [then MCC Ontario director] even 10 years ago. We didn’t do something regularly, but kept in communication.” The Islamic Humanitarian Service helped after 9/11, when Shafiq and Saleem Bhimji, an Islamic scholar, came to the Chandler-Mowat Community Centre, a House of Friendship program, to ease both Muslim and Anglo-Canadian fears. Original participants, who remain committed to the breakfast gatherings, include Leon Kehl, congregational chair at Floradale Mennonite Church; Idrisa Pandit, founder and coordinator of Muslim Social Services in Kitchener; and Fauzia Mazhar, an intercultural health worker at the Kitchener Downtown Community Health Centre. 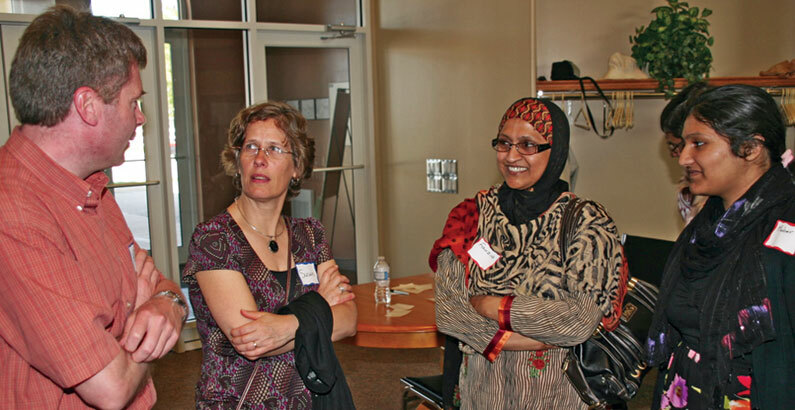 Other participants include interested Mennonites and Muslims from the local community, faith and community leaders, people from various Muslim associations, and people who are interested in this work of interfaith bridgebuilding. Spawned by the Interfaith Bridgebuilding Breakfast group have been several refugee sponsorships. A total of about 50 adults and children have been sponsored by a mixture of Mennonite congregations and Muslim mosques and humanitarian organizations. Groups—one comprising Wanner, Preston and Brelsau Mennonite congregations, together with the Cambridge Islamic Centre; and another made up of Erb, Waterloo North and Floradale Mennonite churches, together with the Waterloo Masjid (mosque) and Kitchener-Waterloo Islamic Humanitarian Services—are sponsoring Palestinians who had been stranded on the Syrian-Iraqi border. The Palestinians lived and worked in Iraq, but had to flee persecution after the fall of Sadam Hussein. Jordan would not accept them and Syria houses them in camps in the desert within sight of the Iraqi border. Burton Buller’s visit was capped by an afternoon celebration of the refugee partnerships at Floradale Mennonite Church. The afternoon included time to visit among Mennonites and Muslims, including the refugee families, comforter knotting and a potluck featuring traditional Mennonite and Muslim foods from a number of cultures. A “Faith and the refugee” panel discussion included Floradale pastor Fred Redekop telling stories of his Russian Mennonite ancestors’ arrival in Waterloo in the 1920s, sponsored by Swiss Mennonites, and of Mennonites in what is now Uzbekistan who were taken in by Muslims there. Omar Al-awsage, one of the sponsored refugees, gave a first-person account with slides from the Syrian camp. A biblical background for refugee support was provided by Moses Moini, a 1992 refugee from Sudan who now coordinates MCC Ontario’s refugee program, while the story of Muslim refugees taken in by a Christian Abyssinian king around the time of Muhammad was recounted by Idrissa Pandit. At the potluck, Leon Kehl announced that another related Palestinian family of 10 had been cleared to come to Canada and that Mississauga Mennonite Fellowship was interested in helping support this venture. The atmosphere around the tables of mixed Mennonites and Muslims was festive, even though in some cases communication was difficult, since most of the refugees have only been in Canada a few months and speak little English. 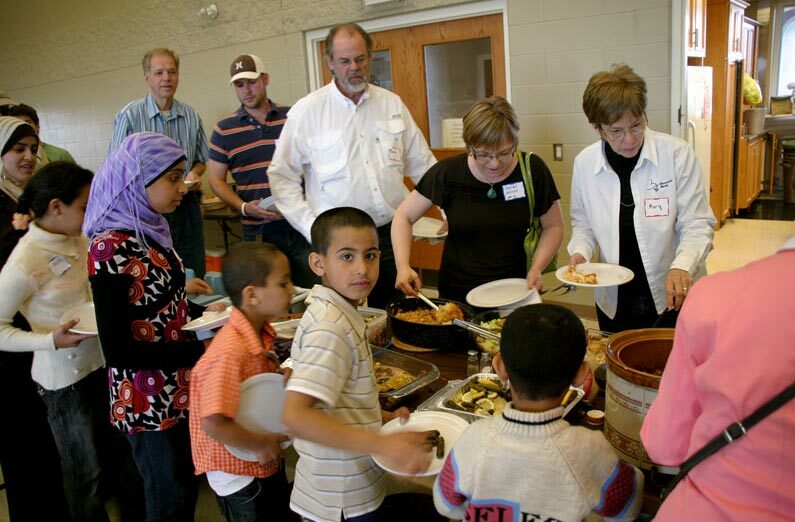 Since the events which attracted Buller, several more congregations have entered into refugee sponsorships, as Muslims and Mennonite Christians continue to actively work at being neighbours and followers of God in Waterloo Region. Grade 12 Rockway Mennonite students Zainab Ramahi, left, and Leanna Wigboldus lead a school chapel this spring. Documentary filmmaker Burton Buller, back row centre in white shirt, joins the multiracial/multi-faith potluck line at Floradale Mennonite Church. 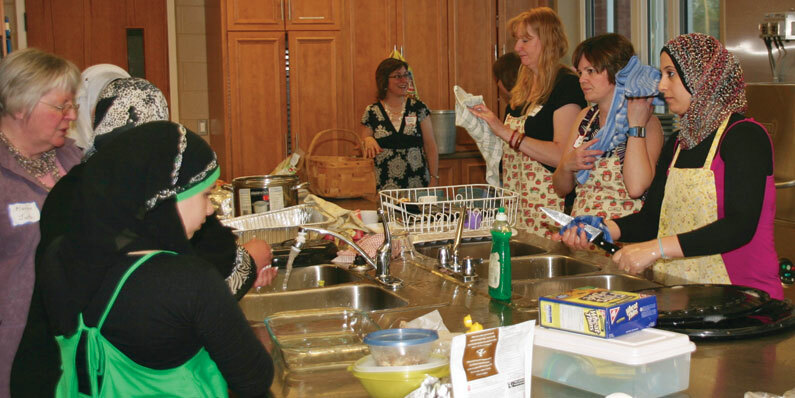 Muslim and Mennonite women clean up after the potluck meal at Floradale Mennonite Church, Ont. 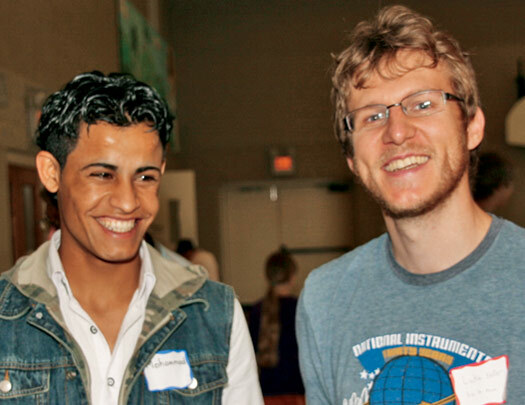 Mohammed, a Palestinian refugee, and Luke Keller of Erb St. Mennonite Church, Waterloo, Ont., share a smile at Floradale Mennonite Church, Ont.